le chaudron de vulcain – December 08 , 2018. EN . Italy / Sicily : Etna , Chile : Nevados de Chillan , Guatemala : Pacaya . Home / blog georges Vitton / December 08 , 2018. EN . 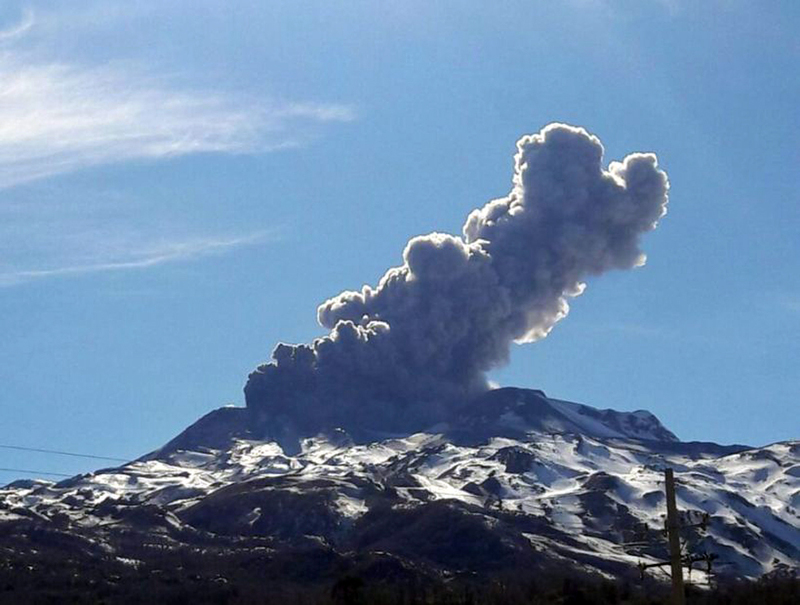 Italy / Sicily : Etna , Chile : Nevados de Chillan , Guatemala : Pacaya . A small cone develops: the point on the state of activity of Etna on December 7, 2018. by Boris Behncke and Marco Neri. 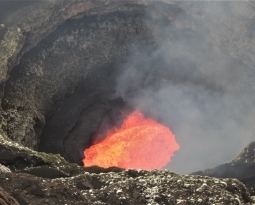 In recent days, strombolian and effusive activity has become more and more vigorous east of New Southeast Crater Etna. Favored by excellent conditions of visibility, this particular eruptive activity was taken up on very evocative images and videos. Here we take stock of the current eruptive situation and situate it in a context of slightly larger events starting from last summer. After the modest but spectacular eruption of the new crater of the south-east of Etna between 23 and 29 August 2018, the volcano never completely fell asleep. 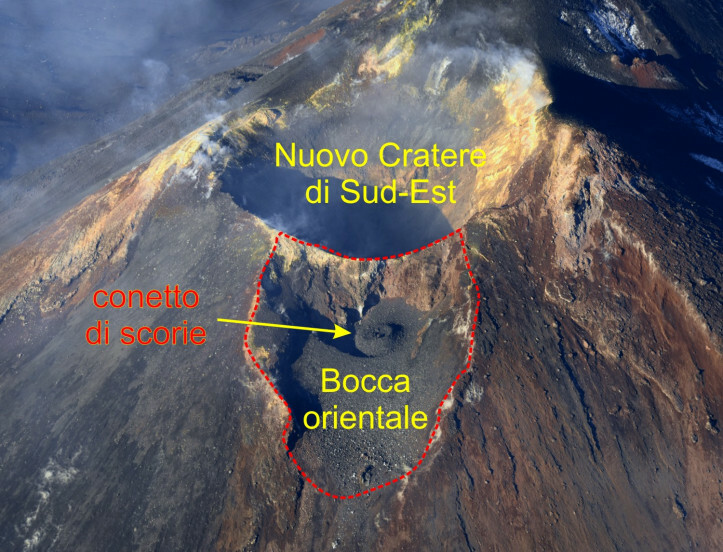 Peak crater activity continued with Strombolian explosions within the craters of Bocca Nuova and the northeast, and sporadic and modest explosions in the New Crater of the Southeast. 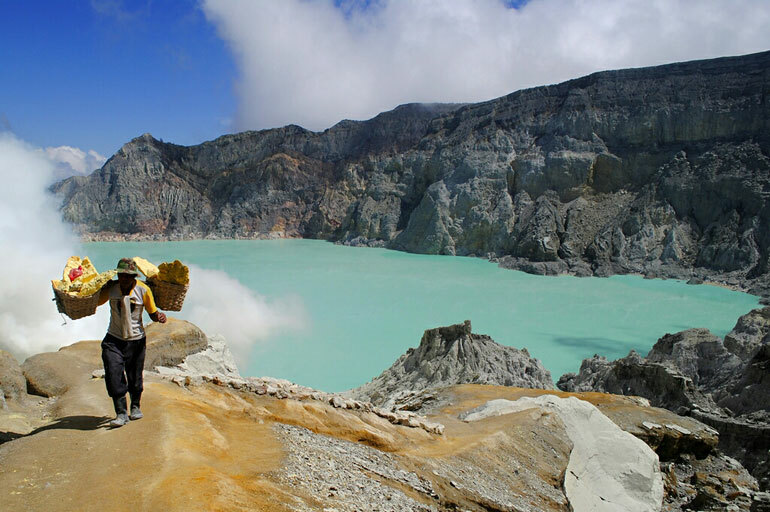 However, for about a month, the New Southeast Crater has seen a gradual increase in activity, especially its easternmost mouth, opened on November 25, 2015, which was part of the active mouths during the summer. 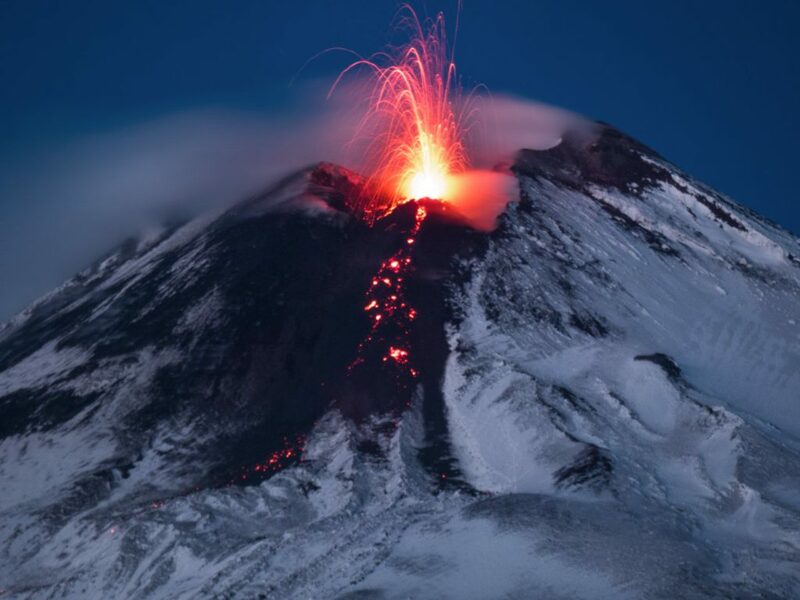 eruption at the end of August and that, in the following article, we will call « Bocca-E ». 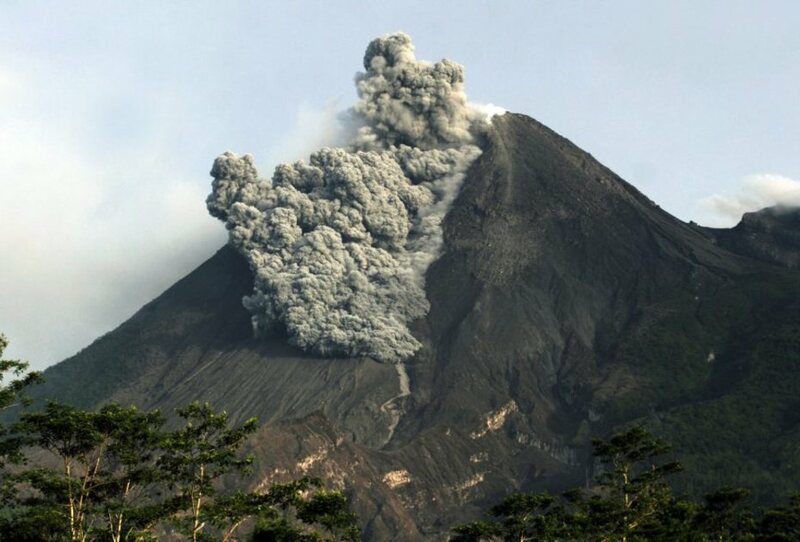 At the beginning of November 2018, Strombolian explosions occurred every 15 to 20 minutes and began to build a small cone inside the Bocca-E (Figure 1). Figure 1 – The small cone of slag at the beginning of its growth inside the eastern mouth (also called « Bocca-E » in this article) of the new southeastern crater, seen from the east. , taken by Stefano Branca (INGV-Osservatorio Etneo). 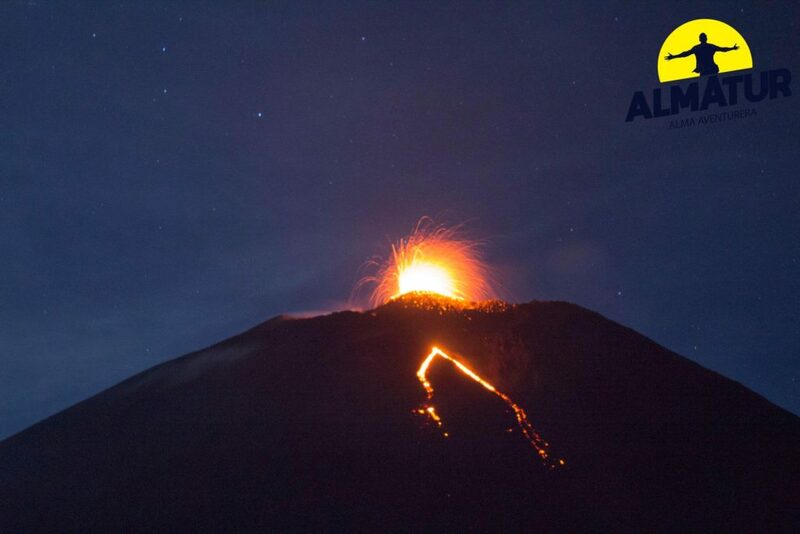 In the following weeks, the frequency of explosions gradually increased and on the evening of November 20, a very small lava flow descended from the cone down the Bocca-E, stopping after a few hours and after reaching a length of a few tens of meters. meters. In the following days, incandescent lava blocks frequently broke away from the eastern cone, producing luminous trails that could give the impression of a resumption of effusive activity. However, it was not until the evening of November 28 that the formation of a real lava flow was observed. Very slowly, this flow extended downward, passing through the eastern edge of the Bocca-E and flowing on the flank of the New Southeast Crater over a length of one hundred meters. Throughout the flow, many incandescent lava blocks continued to detach, resulting in a much larger flow impression on the web and social media pictures (Figure 2). Figure 2 – Strombolian activity and emission of a small lava flow from the eastern mouth of the new south-east crater, seen from the east at dawn on November 29, 2018. The lava flow is very short, but the detachment and the rolling of incandescent blocks at the front and sides of the casting give the impression that it reaches the base of the New Southeast Crater. It should also be noted that the slag cone inside the Bocca-E has grown considerably compared to what can be seen in Figure 1. Photo by Giò Giusa. Among the peculiarities of the eruptive activity, still in progress at the time of publication of this article (December 7, 2018), are the frequent changes in the direction of the lava flows, which generally extend a few hundred meters on the side is from the new southeastern crater and then stopping. The source of the flows has become an already complex structure, formed in part by the magma thrust that arch upwards part of the pyroclastic cone and partly by the accumulation of very viscous lava on the surface, which often does not flow but which produces the rolling of many incandescent blocks. This structure changes continually and remains distinct from the slag cone which is the seat of Strombolian activity, even if it is close to it (Figure 3). Figure 3 – Diagram of the active eruptive zone of the eastern mouth (Bocca-E) of the new southeastern crater. The background photo was taken on December 5, 2018 by Gianni Pennisi. Like the effusive activity, the explosive activity also presents fluctuations: sequences of 5 to 10 successive explosions are often observed, separated by intervals of a few minutes of substantial immobility. At other times, the activity becomes continuous for a few hours, with Strombolian explosions every 3 to 5 seconds. 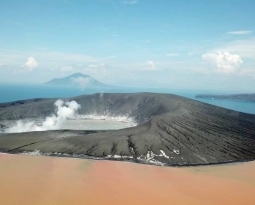 In general, this activity is currently of rather modest intensity, quite similar to the Strombolian activity of the Southeast Crater that occurred between 1996 and 1998. 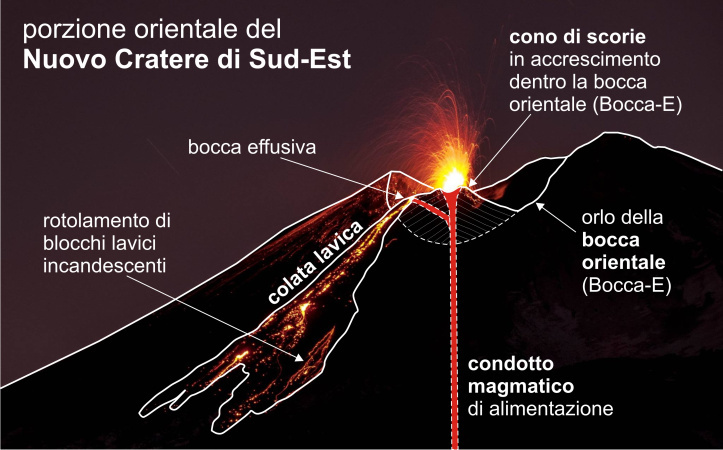 Finally, it should be noted that there is also animated Strombolian activity within the Bocca Nuova and the Northeast Crater, for which currently three of the four upper craters of Etna are active (Figure 4). . 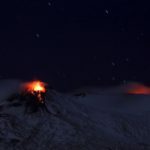 This situation is also reminiscent of what was observed in the late 1990s, when Etna had gone through a long period of continuous activity at the summit, which lasted six years. Figure 4 – Activity in the crater of Bocca Nuova (left) and in the eastern mouth (Bocca-E) of the New Southeast Crater (right) in the early hours of November 29th. Photo: Sergio Scornavache. 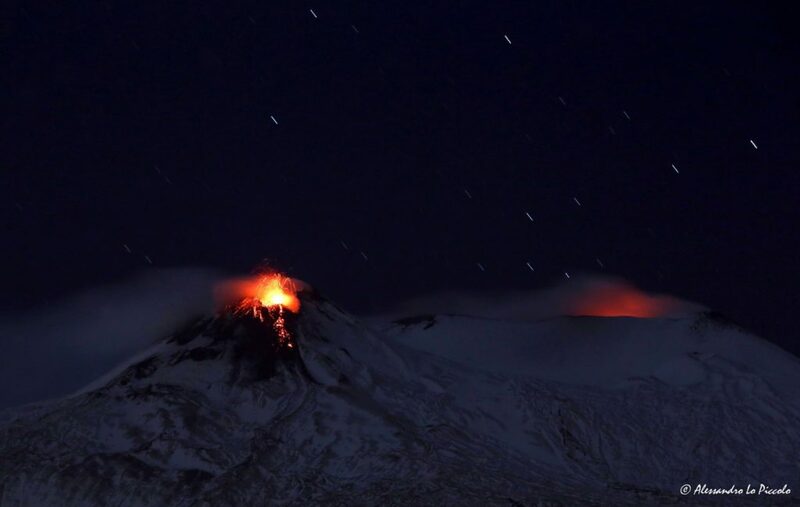 Special Report on Volcanic Activity (REAV), Nuble Region, Nevados Volcano of Chillan, 07 December 2018, 04:30 local time (mainland Chile). Yesterday, Friday 07 December 2018, from 03:13 local time, monitoring stations installed near the volcanic complex Nevados de Chillan recorded the occurrence of an explosive event, with an earthquake associated with fluid dynamics at the inside volcanic ducts (long period type). This explosion was associated with a seismic signal with a reduced displacement value considered strong. On the cameras installed by Ovdas, it was possible to observe an incandescence associated with the emission of gas and pyroclasts at high temperature, those falling in an area near the active crater. At present, no other abnormal signals have been recorded. Geographical location: 14 ° 22’50˝ Latitude N; 90 ° 36’00˝ Longitude O. 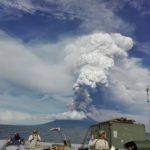 Due to weather conditions, it is not possible to see the volcanic cone, seismic stations record tremors associated with rising magma and gases on the surface. Strombolian explosions are generated 5-25 meters above the Mackenney crater, incandescent reflection is observed. with lava flow northwest (towards Cerro Chino).